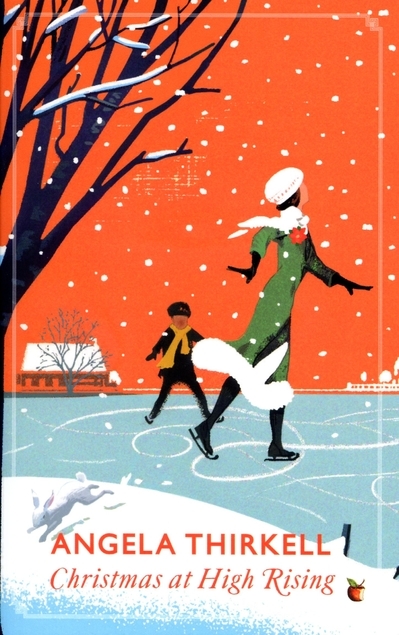 August Folly by Angela Thirkell was a re-read for me as although I’ve read all of Thirkell’s Barsetshire books, I read them out of order, just as I managed to find the books. I actually enjoyed this one one more the second time around. It had been my first ever Thirkell read originally and I’ve grown to love them more as I got to know the places and people better. She nicked ideas from a variety of classic authors, not just Trollope, there’s a wee bit of an homage to Jane Austen in this one. August Folly mainly involves the large Tebben family, the Deans and the Palmers and a big part of the story is about the rehearsals for a play being put on in the village, the cast being a mixture of wealthy inhabitants and the locals that serve them as servants or in local shops. I suppose plays within books are a classic but I found the constant references to the play and Greek to be a bit annoying. On the other hand I did enjoy the children, especially as the younger Tebbens are a wild lot who think nothing of climbing all over the gables of their home, just about giving their mother heart failure. I love the names of the surrounding villages, they all have wool connotations, Fleece, Winter Overcotes, Winter Underclose and Worsted. 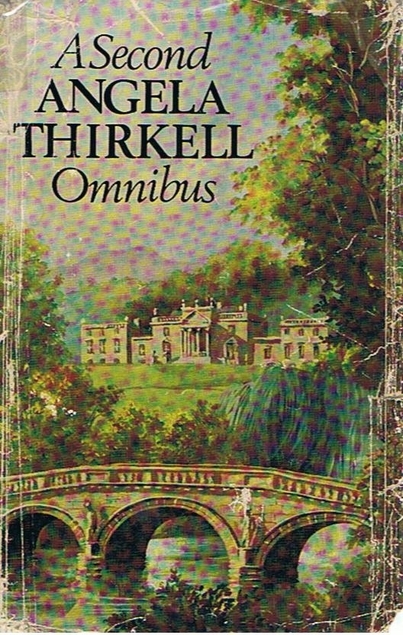 Thirkell was a terrific snob of course, and I usually just have a laugh to myself about that, but in August Folly one of the characters gets a third class degree from his university, but ends up getting a good start in a career from one of his neighbours as a thank you. That it’s not what you know but who you know mentality is something I really dislike in the real world. The wartime books are by far my favourites so I’m looking forward to getting to those ones. I love it when Thirkell has a good old rant about the rationing, queuing and the government. I think those rants must have cheered up many struggling women trying to feed and clothe their families. 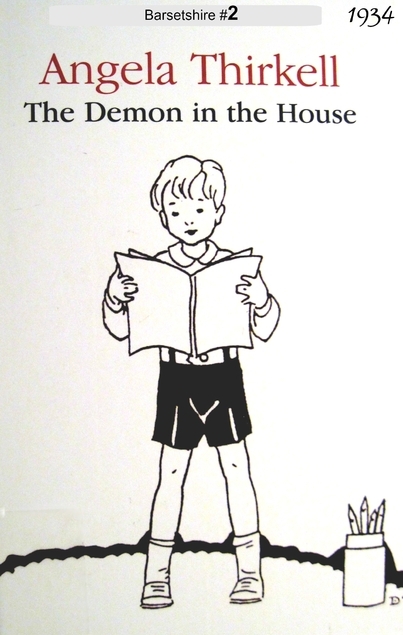 The Demon in the House by Angela Thirkell was published in 1934, a busy year for the author it would seem. She so fell in love with her character Tony Morland who first appears in High Rising – that she had to write more about him. He is of course the twelve year old son of Laura Morland who is a writer, it’s difficult not to assume that the Morlands are based on Thirkell’s own family. This was a first time read for me as I had trouble finding a copy to buy at what I regarded as a reasonable price, luckily I managed to borrow it from the library, albeit in large print. As the youngest of Laura’s four boys and never having known his long dead father, Tony is rather pampered, but he’s an exuberant lad, always getting into scrapes, breaking windows, ruining clothes, washing the newly shelled peas down the sink, retrieving them from the u-bend and eating them! You get the idea, he’s a bundle of trouble but at the same time adorable. This portrayal of the relationship between a young boy and his mother is by far the most realistic I’ve read, despite Tony’s exaggerated character. Every bike outing of Tony’s has Laura imagining the worst. At the end of the book she is sorting out the clothes for his school trunk, he’s moving up to the senior school and going from short trousers to long ones, a huge rite of passage for boys and mothers in those days. What really surprised me about this book is the many mentions of Hitler. Tony says Hitler murders practically all Germans. He knows what he would do. He’d put an electric shock machine in his telephone and when Hitler answered the telephone he’d get electrocuted. If only it had been that easy. I read this one for the 20 Books of Summer Challenge. 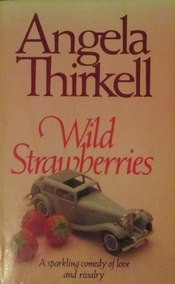 Wild Strawberries is the second of Angela Thirkell’s Barsetshire books, first published in 1934 but my copy is a 1983 Hamlyn paperback. This one revolves mainly around the Leslie family. I remember someone commenting years ago that the Leslies were their least favourite characters, and I can see that some people could find them very annoying indeed, but they’ve suffered tragedies that money can’t cushion. There is a sort of sense of entitlement pervading them but for me there’s just enough charm there to be able to forgive that, although I could see David Leslie far enough – as they say. Lady Emily Leslie is so disorganised that she can’t get anywhere on time, not even to church, and it holds everybody up. Even when she gets there she causes chaos with her stage whispers as she tells everybody where to sit. The eldest son was killed in the Great War and the youngest son David is absolutely full of himself, has umpteen lady friends and never gives a thought to any of them. John who is son number two is the sensible one. His wife Gay died after just a year of marriage. With the arrival of a family friend to stay for the summer and some French visitors who have rented the vicarage (I doubt if that was actually possible) the story evolves with the usual bits of romance, uppity servants and mothers of young children who are incredibly relaxed about them, not batting an eye when they cause havoc and mess. After all, why worry when the nanny will sort it all out! This one is entertaining and interesting as David Leslie is hoping to get a job at the BBC which is in its early days and it seems that any ‘toff’ with the right sort of an accent could get a job there – even women! It’s obvious that most of the young men working there were gay, but sometimes settled for a ‘companionate’ marriage – to the right sort of girl – with money of course. At one point David Leslie is at the railway station to meet someone and the London bank-holiday train disgorges lots of hikers, a few of which give him the Fascist salute – I wonder just how common that was in 1934, just a year after Hitler took power in Germany. This book is one of my 20 Books of Summer. One of the books on my 20 Books of Summer 2017 list is Angela Thirkell’s High Rising, a re-read for me because I wanted to read them all in the correct order this time around. High Rising introduces many of the inhabitants of Barsetshire, that updated setting of many of Anthony Trollope’s books and featuring some of the descendants of his characters, but that is by the by as it really doesn’t matter if you haven’t read those books. The book was first published in 1933 but my copy is a modern re-print with an introduction by Alexander McCall Smith. It mainly features Mrs Laura Morland, a widow with four sons, three of whom are out in the world, but her youngest son Tony is still at prep school and he’s the reason she keeps writing her very popular Madam Koska books, she needs the money they bring in to pay for his school fees apart from anything else. Tony is an exasperating little boy, absolutely full of himself and constantly boasting, but there’s a lot of comedy in Tony’s shenanigans. Thirkell had two sons of her own and I’m sure that she was using an actual boy as a template for Tony’s character, he’s obsessed by trains and has an urge to pass on all his railway information to anyone he comes across. Anyone with sons will recognise that stage, although in my day it was more likely to be dinosaurs or F1 racing. George Knox is really just an adult version of Tony, someone who loves to hear his own voice, but he has taken on a secretary to help him write his books and there’s something odd about her. She seems to be far too familiar considering she is a type of servant, she is behaving more like a wife, and George’s friends fear she will hook him. Can Laura save George from the clutches of the obviously mentally unstable secretary, whilst shedding her tortoiseshell hairpins? I googled kirby grips/Bobby pins to see when they were invented and it seems to have been in the 1920s, but Laura was sticking loyally to the old fashioned hairpins which do fall out easily, I know as I have some from way back then. I enjoyed reading this one just as much as the first time I read it. If you want to read my more detailed review from then have a look here. Three Score and Ten by Angela Thirkell is her last book, unfortunately she died before she was able to finish writing it, but her friend C.A. Lejeune finished it off for her, presumably she had left some notes. 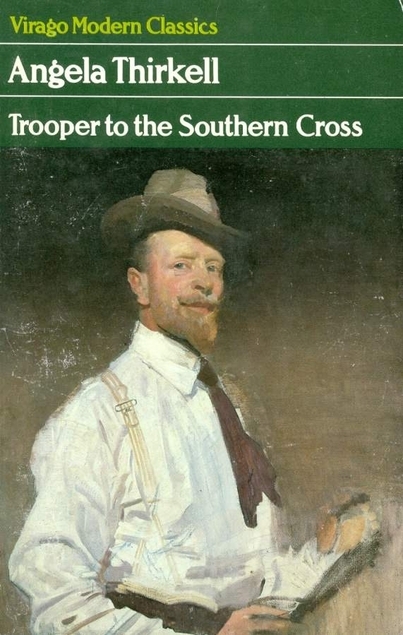 I think that Lejeune did a fairly good job of it although as it was the year of Princess Margaret’s marriage to Anthony Armstrong-Jones that was given a few mentions and I believe that Thirkell didn’t write about such things, although I could be completely wrong about that. 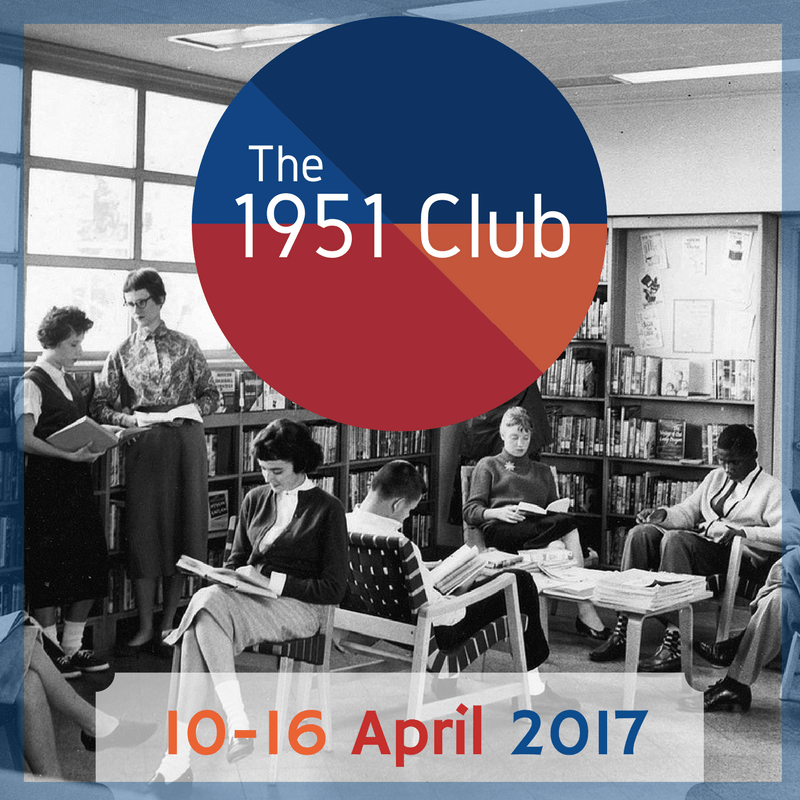 The three score years and ten belong to that famous Barsetshire novellist – Mrs Morland. Of course strictly speaking she isn’t a local as she has only been there for forty years, but she’s very popular with young and old and they’re keen to mark her big day in some way. With Mr Wickham in charge of the booze procurement her party is obviously going to be a success. This book features many of Barsetshire’s favourites – such as Sam Adams and his wife Lucy. The dreadful bishop and his wife are kept at bay as usual and it is that swine Lord Aberfordbury who provides the conflict by planning to knock down some well-loved cottages to build a factory on their site. It is well known that it is not safe to have books in the house as they marry and have children, so producing over-populated neighbourhoods; but attics are just as bad. So, if one comes to think about it, is one’s own desk or writing table on which letters answered and unanswered, cards of invitations to various meetings, a Christmas Card that one can’t bear to throw away because it is so pretty, a notice of a concert that took place two months ago, one or two newspaper cuttings, a newspaper which one kept because because one meant to cut something out of it and then forgot what it was, all get mixed up with one another, all lie in confusion; and old bits of furniture and other odds and ends do certainly increase and multiply. Purists may decide not to read this one as Thirkell didn’t manage to get it finished but I think that Lejeune did manage to write in her madly rambling style and also reproduced the ways of speech employed by the ‘lower orders’, that’s probably one of the things that so annoys people who aren’t fans of Thirkell’s writing, thinking it points her out as being a horrible snob, but it’s a skill writing in what is really a dialect just as she sometimes writes in a Scots dialect, and of course, she got that right too as her father was Scottish, she spent a lot of time in Scotland and had J.M. Barrie as her godfather. 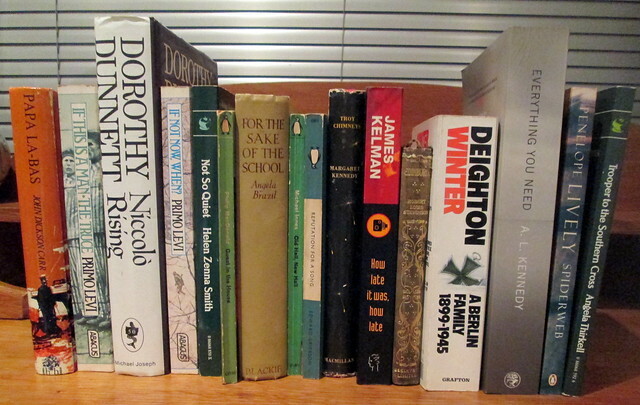 I think I’ve now read all of her Barsetshire books, except the first one Northbridge Rectory. I’m waiting for a copy of that to arrive in the post, and when it does I intend to start reading the series again, in order this time. They’re comfort reads for me, perfect reading during yet another general election campaign and what seems like a constant stream of bad news stories.